In a big, glass bowl, combine a washed, thinly sliced cucumber with the skin still on, thinly sliced onion, a couple of teaspoons of salt and three or four tablespoons of sugar. You might want to toss in a few sprigs of dill, too. Cover the ingredients with white vinegar and let them soak up the flavors in the fridge overnight. Leave all the ingredients in a covered bowl in the fridge or divide them into jars, as we’ve done in the photo. They’ll keep for about a week. Summer is the time of year for cucumbers, with peak season May through August. Did you know cucumbers provide Vitamin C, Vitamin A, fiber, potassium and folate? For being so mild and “cool” they are delicious raw with a dip, or mixed into a variety of cold salads for a refreshing crunch. How Stacey Got the Shot: With the fabulous 105mm f/2.8 lens at f/4.5, shutter speed 1/60 second. ISO 400. This time, I also used a light box. "keep up to one week in the refrigerator"
Healthier Potato Chips – Hey, Why Are You Laughing? Hey, Baby! This Food is for You! 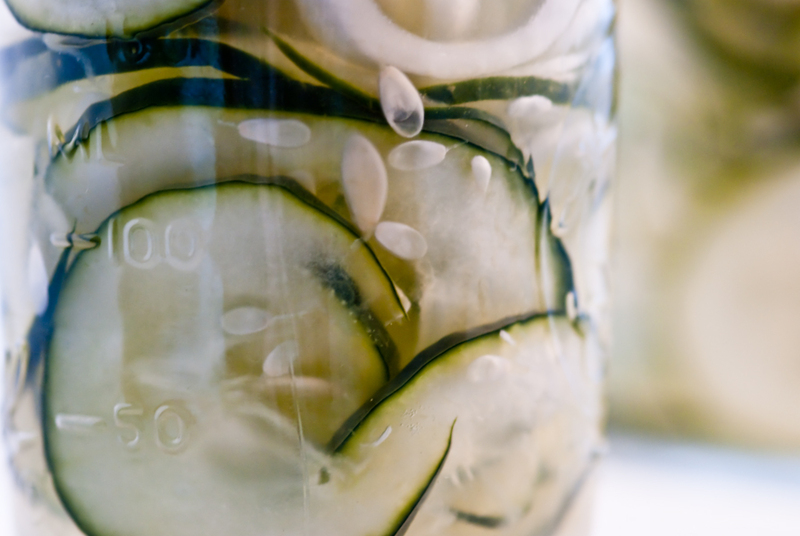 I was just thinking of pickling some cucumbers and I found a how-to! Thanks for the post and a great shot!